1. Prepare jeans by sliding a piece of cardboard into the leg (flattened cereal box will work). Spray temporary adhesive to back of stencil. Position stencil as desired. 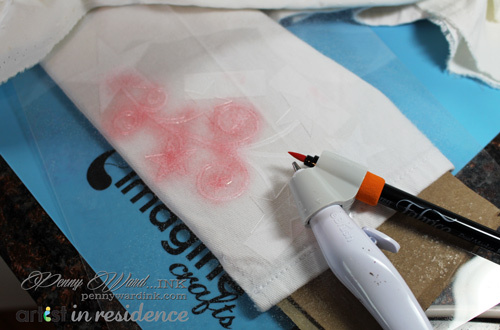 Use an eBrush and Fabrico marker to stencil design. 2. Heat set before wearing or washing. NOTE: eBrush does not have an adapter for the Fabrico marker. You can make the marker work by cutting a foam pencil holder lengthwise and wrapping around marker before sliding it in the adapter.